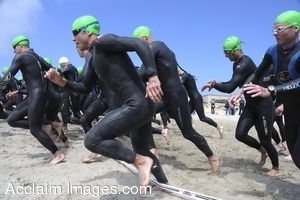 Description: Clip art photograph of triathletes rush to the waters off Point Mugu for the start of the Armed Forces Triathlon. The triathlon, held at Naval Base Ventura County, consisted of a 1.5-kilometer swim, 40-kilometer bike ride and a 10-kilometer run. Top triathletes from each branch will compete in the CISM Triathlon in Estonia on June 15. (U.S. Navy photo by MC1 Michael Moriatis.) Clipart photograph by Department of Defense Public Domain.